WILLEMSTAD - The renovated Parliament hall in the Wilhelmina Plaza was inaugurated today. 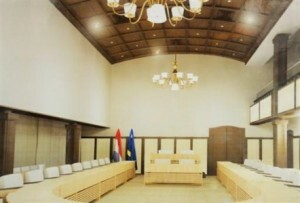 Since the beginning of the new nation, on October 10, 2010, Parliament has met in the hall of the former island council in Ansinghstraat. If there are people interested to see how the interior looks like, they can do so from the public gallery during the public debates.